manila fashion observer: Stella McCartney x Gap! Goodness Gracious! Stella McCartney x Gap! Goodness Gracious! Berry! Aren't we in for a treat!!! This also goes to all you mommies, grandmas, aunties and godmothers plus petite women who can fit into little kids clothes! 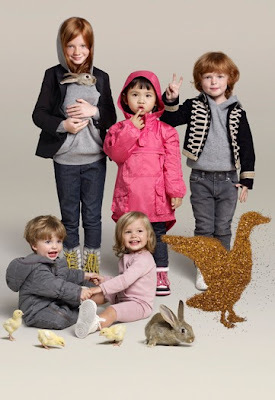 According to WWD, "Stella McCartney's first full children’s wear collections, done in collaboration with GapKids and babyGap, will be launched Nov. 2 at select Gap stores in the U.S., Canada, the U.K., France and Japan. The 70-piece line, which McCartney said she designed to 'find a kind of balance between Stella as in what I do for adults…and how I see kids, really,' takes inspiration from both the design signature McCartney has developed in her own collections and her practical experience as a mother of three." I want to stock up for Berry! 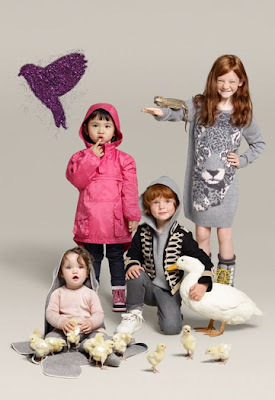 (The collection’s sizes run from newborn to children up to age 12). According to the article, "McCartney made sure the fabrics she’s used in the collection — such as organic cotton, cashmere and wool — aren’t 'scratchy,' and has incorporated fun elements to entice children as much as their parents." Maybe I will stock up for myself too? For Berry's benefit, heehee. WWD points out, "Some of the pieces are mini-me versions of designs from McCartney’s rtw collections. There’s a gray sweater dress knit with an intarsia leopard design — which appeared full-size in the designer’s fall 2009 collection — along with skinny gray jeans with ankle zippers and a snug gray cable-knit cardigan dress." Prices for the collection run from $14 for wool tights through to $128 for a military-style jacket (I want that one!). ooohhhh! i can't wait. i will save all my earned points at gap! i might as well stock up as well. i have two girls and it'll be worth it ;) hehehe. i am so excited! please post a reminder. i hope to buy at least an outfit for eulla's and tia's birthday. Heehee! I knew you'd get excited about this too Belle! I will remind you, don't worry!! !